There was an awful lot of chocolate. 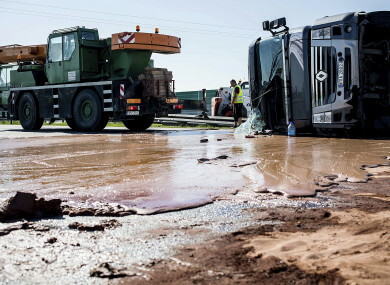 A TANKER TRUCK turned a stretch of road into Poland’s sweet spot when it spilt 12 tonnes of liquid chocolate after crashing through a traffic barrier. Local police said it was unclear why the truck belonging to a sweet maker slammed into the central reservation on the A2 motorway between the western towns of Wrzesnia and Slupca. After flipping over, the tanker came to rest across lanes and the chocolate barred traffic in both directions. The driver was hospitalised with a broken arm. Passing vehicles left chocolate tire marks across several kilometres before authorities closed down the motorway. “It will take several hours,” local firefighter chief Bogdan Kowalski told TVN24 television. Email “Truck crash spills 12 tonnes of liquid chocolate onto Polish motorway”. Feedback on “Truck crash spills 12 tonnes of liquid chocolate onto Polish motorway”.